The iconic grade II listed Preston Bus Station was the largest station in Europe when it was completed in 1969, made possible by the opening of the M6 (Britain’s first motorway) and the growth of Central Lancashire New Town. Recently Lancashire County Council has considered rerouting the buses entirely to the eastern side and reprogramming the western portion of the site in order to improve connectivity to the City Centre and to establish a stronger civic space. 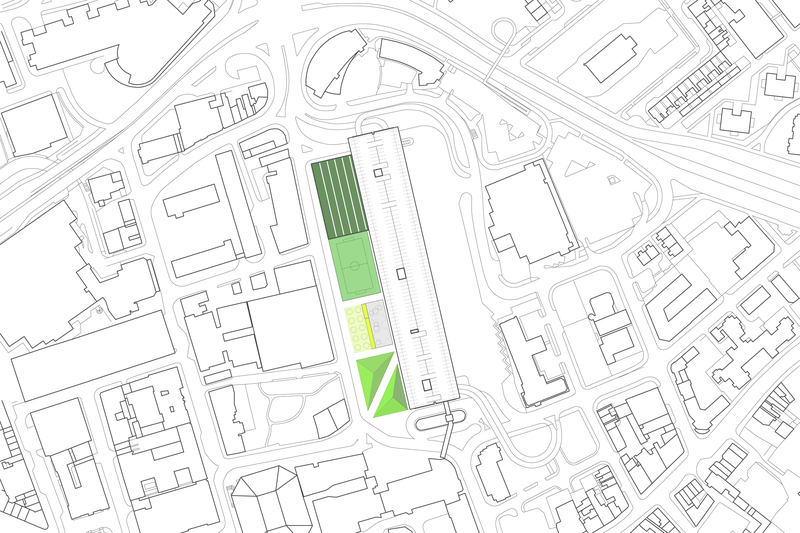 Acknowledging the station’s unprecedented size, the proposal is organized around four distinct but interconnected blocks that run the entire length of the western side. A new youth center building is located at the northern end— a floating rectangular volume that slips under the concrete decks of the car park. Above grade the building’s organization echoes existing spatial configurations. Kitchen and dining areas, arts and crafts, and informal meeting zones are located on the concourse level, establishing a well-connected living room for the center and overlooking the basketball courts below. The additional athletic spaces, all located on the lower level, open directly onto the center court. The court in turn opens directly onto the soccer field to the south. Large sliding doors under the pedestrian bridge allow for a seamless ground condition. On warmer days the interior of the youth center is able to function similar to a large covered outdoor play area. The open relationship to the outdoor field enables the building to capitalize on both stack and cross ventilation for cooling. 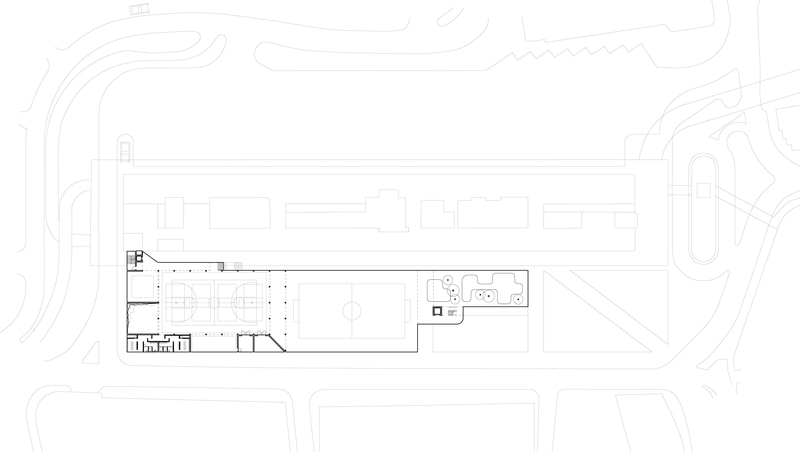 The upper level of the building wraps around the volume of the basketball court and houses administrative offices, meeting rooms, and other youth programs including the health clinic and counseling areas, all of which open out over the surroundings. The music room and the performing arts spaces are tucked away in the back and overlook the other side of the bus station concourse, the half which will remain in operation. Over the youth center is an intensive green roof which forms part of a site-wide strategy for grey water remediation. Runoff from 130,000 sq ft of existing hardscape on the site is distributed to the roof and the other blocks on the site. The sunken soccer field leads under another public pedestrian bridge and directly to a skate park— an undulating topography interspersed with informal clusters of trees. A long bar housing an elevator and stair can be programmed for public access and allows the athletic spaces the opportunity to interact with the greater community. Adjacent to the bar at grade is a bosquet. The southernmost block of the site is defined by two large earthen mounds (formed from the excavation of the athletic spaces) that form a dramatic valley for the main path leading into the terminal and atop offer expansive views of the iconic car park decks, the soccer field, and the neighborhood. A new telescoping door configuration along the perimeter of the existing terminal adapts to both the bus bays on the eastern side and to the proposal on the west, establishing a stronger relationship between inside and outside as well as public and private programs. The remainder of the existing structure was largely left as is. The design strategy here is most concerned with preserving the terminal’s existing character while improving lighting and wayfinding in a straightforward but deliberately modest fashion. The overall project focuses on setting up maximum transparency between the youth center, the bus station, and the city at large. Rather than approaching the project at the scale of a single building, the proposal is characterized by a larger scale urban gesture, a deliberately low organization, and the introduction of a series of contemporary grounds in the City Centre.